As of Friday, February 13th starwars.com presented each of the selected talented Star Wars artists appearing in the Celebration Art Show this April in Anaheim, featuring a Preview or Sneak Peek of their LE Star Wars Prints! This funtastic display of Awesome Art can be found throughout the exhibit hall floor, or in the Art Show pavilion sponsored by ACME Archives. One of those Great Artists is none other than my good friend, Steve Anderson. Steve has been an Official Star Wars artist for Lucasfilm Licensing and some of their licensees for the past seventeen years. Not to mention he has created artwork for all six movies in the Star Wars saga, including: Star Wars: The Clone Wars, Star Wars: REBELS and all four Indiana Jones movies. Of course, this is only a small portion of a very long list of exceptional credentials and art excellence relating to licensed properties such as: G.I. JOE, Indiana Jones, Pokemon, Lord of the Rings, Narnia, Spider Man, Transformers, Jurassic Park, X-Men, Disney-Pixar, Marvel, Universal Studios and many other affiliates or licensees of the latter studios mentioned. To top that off, Mr. Anderson was also the stand-in for Harrison Ford in the feature film Extraordinary Measures! Over the past eight years, or so, Steve has been asking for my help with his LE Star Wars Celebration art and now, my titling ideas have gone beyond much more than that of Star Wars. I couldn’t be more grateful of such a wonderful opportunity; it truly is a gift, to be a part of something so grand (IMO) and so permanently imprinted … pun intended. Not too long ago, I posted an article via The Cantina Cast on our past collaborations and on how we creatively harmonized in complimenting one another; successfully correlating the main attractions or finished products. This time was no different. Last October, Steve reached out to me via text and officially asked me (not that he has to at this point, it’s practically a given that I’ll say yes) if I’d be interested in titling his LE Star Wars design for Celebration Anaheim. After my private “squeeing” and responding with an official “yes” … the texting, emailing, voice mails, and phone calling began. However, this particular joint-effort had some red tape, so to speak. The first initial ideas, titles included, were nixed for reasons I cannot divulge. After that minor setback and being a little panic-stricken, due to deadlines and such, we pressed on. As I said, the original concept was discarded and the new one was set into place; REBELS. Again, I’m not allowed to see the sketch or outline, I have to envision what he’s physically composing and believe you me, that’s no easy feat. Once I have created some sort of imagery in my mind of what this magnum opus might actually look like, the focus begins. Shutting everything out except for the concept, I start to compile a list of titles. Keeping the wordplay to a maximum of four, but preferably three, the mini synopses are forged and the selection commences. For more information on Steve Anderson’s artwork go to: www.SteveAndersonDesign.com He’s also on Facebook, Instagram, DeviantArt.com, and Twitter @SteveDAnderson and tell him Becca sent you! A huge Shout Out to Steve Anderson, Thank you for believing in me, my musings, and writing abilities! Next article Jay's Galactic Espressions: Hands Up If You Love Star Wars! What a great opportunity you’ve had to collaborate with Steve the past years! This new artwork is exciting, indeed! 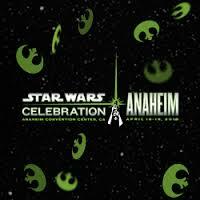 Can’t wait to check out all of the artists at Celebration!! Thanks Jay! Yes, truly, it has been a blessing 🙂 There’s a few more pieces that he asked me to title, but he’s waiting on an approval before he can release them and before I can “publicly” discuss/write about it.